The EUREC College of Members 52 took place in Brussels, at the premises of the Museum of Natural Sciences, on 23rd and 24th May 2017. Speakers from the European Commission, and EUREC’s members met to discuss the effect of digitalisation on the energy system. Mark van Stiphout, from the Directorate-General on Energy, presented the EU strategy on digitalisation of the energy system: regulatory and R&D support. Noah Daniel Pflugradt from Berne University of Applied Sciences presented the Influence of consumer behaviour on residential energy systems. Berne UAS has developed an agent-based simulation that models the occupants in great detail to accurately predict for example the difference in self-consumption of a PV system between an unemployed family to a double-income-no-kids couple. This model is useful not only to simulate PV systems but also to generate load profiles and occupancy profiles for example for low voltage grid and smart grid research and energy system management development. The long-term plan is to extend the model to cover commercial and industry buildings to accurately simulate every single person in a city district and make it possible to do detailed scenario analysis on the impacts of growth rates, population structure, infrastructure development and much more. Werner Friedl from the Austrian Institute of Technology presented the work of the Smart Grids Technology Platform, now SNET-ETIP (European Technology and Innovation Platform for Sustainable Network towards Energy Transition), as well as the Smart Grid Architecture Model, and AIT Smartest Laboratory. David Moser from EURAC presented "The role of energy flexible buildings in the future energy system”. Energy consumption must become more flexible in order to allow for greater shares of renewable energy in the system. Atilla Ersoz from TUBITAK MAM presented Turkish activities related to smart grids. The final discussion focused on the predicted increase in electrification versus the need for more sector coupling, and a portfolio of different approaches related to the future production and use of energy. It was pointed out that the issue of electricity availability is not stressed enough nowadays, in order to favour messages related to the electrification of the energy system. If it is undeniable that there will be electricity abundance at some time, we should not forget the importance to use electricity in an efficient way. Finally, the issue of cybersecurity related to the energy system was also stressed, as becoming a more and more pressing issue. The next EUREC College of Members will take place in Gebze (Turkey) at the premises of TUBITAK MAM in November/ December 2017. The dates will be soon communicated to EUREC members. The "PV Manufacturing in Europe" Conference organised by the European Technology and Innovation Platform for Photovoltaics (ETIP PV) took place on 18 & 19 May 2017, at the BIP House in Brussels. Key industry leaders, scientists, engineers, and policy makers joined to debate the status and future of "PV Manufacturing in Europe". Over 120 PV specialists from 16 European countries attended the conference. The Conference was chaired by the ETIP PV Chairman Marko Topič, who opened the conference stating that "Photovoltaics continues to experience a world-wide boom. Europe had installed more than 100 GW by the end of 2016, with more than 300 GW installed worldwide” and added that electricity from PV reached competitiveness across Europe. He also stated, "To accomplish the targets of the SET Plan, Europe must participate in this global expansion by manufacturing and exporting advanced, high-quality PV technology, across the whole value chain at a significant scale. This will generate significant wealth and energy security for the continent. Furthermore, deployment of PV technology will enhance energy security. This will be true for Europe, as for countries across the world. All major future energy system forecasts show a key role for photovoltaic solar energy. Further, the COP21’s overarching goal from Paris last year to reduce greenhouse gas emissions and to limit the global temperature increase clearly showed that expectations and projections for PV are high. Europe must accelerate R&D and innovation activities to strengthen competitiveness across the whole value chain of PV manufacturing in Europe”. Arnulf Jäger Waldau, Senior Scientist at European Commission, DG Joint Research Centre of the European Commission, underlined Topič’s statement: ”Decarbonising the electricity sector until 2050 is mandatory to achieve the targets of the Paris Agreement and solar is one of the pillars to achieve this decarbonisation. Over the last decades, there is significant continuous technology progress and for all PV technologies the progress has been greater than predicted in various roadmaps”. Gaëtan Masson, ETIP PV Vice-Chairman and the Programme Chair of the conference, said "PV is mainstream and will be the number one energy source by 2050. However, the complete PV value chain must be represented in Europe, or the innovation ecosystem will collapse. Europe now represents less than 8% of the global PV market and this means that we need a clear industrial strategy and we should consider a ‘Buy European’ policy for public procurement”. In one of the sessions the discussion treated technologies that could ensure PV manufacturing developments in Europe in the coming years. The session was joined by major PV companies from Europe and discussed whether new developments could economically make sense for manufacturing in Europe and how key European actors could benefit from them. Dr. Peter Wohlfart, Singulus Technologies pointed out, "that the European equipment manufacturers still play a very important role for the further development of crystalline and thin-film production technologies”. According to Dr. Wohlfart, the European equipment suppliers require three fundamental components to keep globally competitive: A focus on core competences in equipment hardware and processes, the cooperation with experienced and challenging industrial cell and module producers and joint development projects with the globally leading European research institutes to transfer new technologies from laboratory into mass production. Milan Nitzschke from Solarworld echoed Masson’s words: "Europe needs to keep an intact complete PV value chain. It is not enough to focus on the far upstream and far downstream ends. Losing the core parts of the industry would impact all other parts and risk to lose the entire EU key enabling technology PV at the end. Europe must continue to differentiate by quality and technological advance. Tech-wise we're 1-2 years ahead, but we need to restore a fair level playing field in the market." 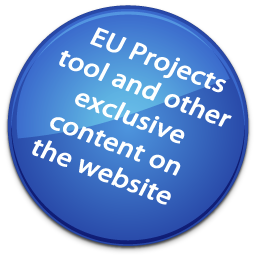 The European Technology and Innovation Platform for Photovoltaics (ETIP PV) support the European PV sector in realizing its ambition to be a major player in PV’s emergence as a multi-terawatt power source. The European Technology and Innovation Platform on Renewable Heating and Cooling (RHC-ETIP) will organise the 2017 edition of its annual event on 20th June in Brussels. The event "Innovation in the renewable heating and cooling sector" aims to discuss the conditions to increase innovation in the RHC sector in the EU as well as the role of renewable heating and cooling in the SET Plan. The RHC-ETIP is looking forward to welcoming our members and all other stakeholders who are interested in our work on the definition of research and development priorities. Registration for the first session is available on the link below. Registration is free of charge but mandatory. In order to register for the event as well as the technology panel meetings on the 20th June please fill in and submit this online form by 6th June. The agenda is available here. Further information on the RHC-ETIP is available here. 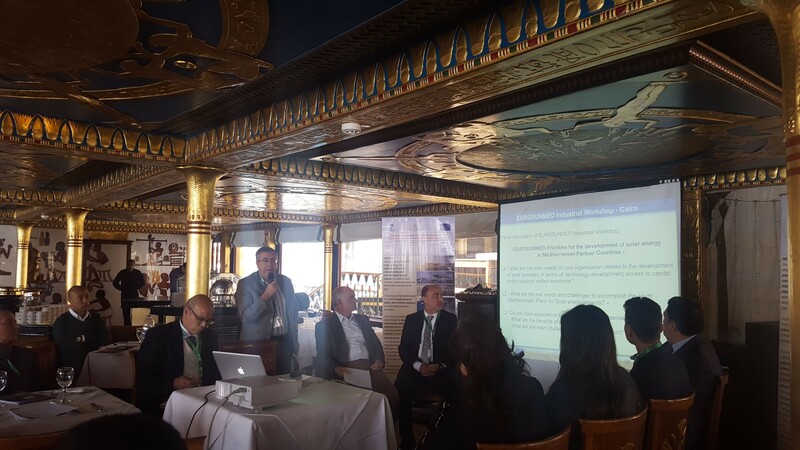 The workshops featured presentations both from EUROSUNMED partners on the main results achieved by the project, as well as on the EUROSUNMED Roadmap, and from stakeholders from Mediterranean Partner Countries (MPCs) related to technological, and market challenges to the development of renewable energies in MPCs. What are the main needs of your organisation related to the development of solar business, in terms of: technology development; access to capital; policy support; skilled workforce? What are the real needs and challenges to accomplish the south Mediterranean Plans for Solar energy projects? Do you have experience on cooperating with organisations from the EU? What are the benefits of such a cooperation? What are the main obstacles to such a cooperation? The main obstacles to the development of a renewable energy industry in Morocco is the lack of raw materials, such as glass for the production of mirrors. Morocco has not developed a suitable environment for the development of start-ups: the access to capital is still an issue. For instance, it is not possible to access crowd-funding, which is one of the types of funding which supports the pre-commercialisation of a product. Political will, which has, for example, pushed for the creation of a specific agency, such as MASEN, is a positive factor, which has so far supported the development of renewable energy in Morocco. Cooperation between Mediterranean Partner Countries (South-South cooperation) should also be strengthened. A supra-institution could be created in order to further develop the renewable energy market in the area. 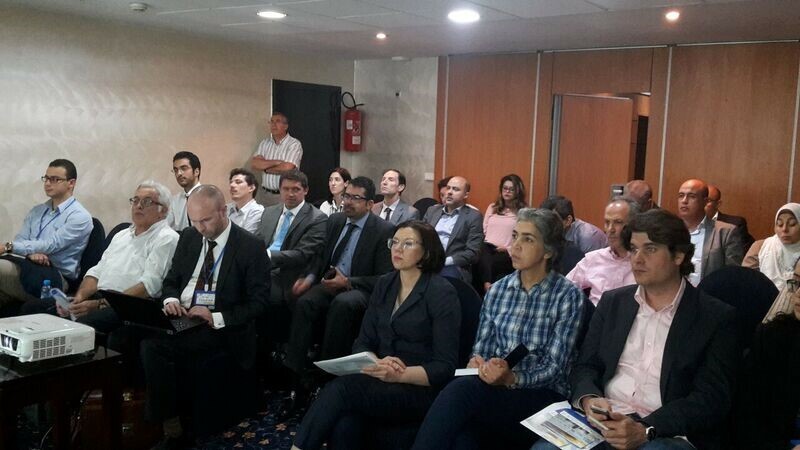 In terms of technology development, Morocco is focusing on the hybridisation between PV and CSP. Energy storage and grid integration are two important supportive technologies, where further efforts should be focused with a view to develop the renewable energy industry. There is need for a constructive dialogue between the government and the industry in order to solve current problems and define clear steps for the development of a local manufacturing industry in Egypt. Other stakeholders, such as the banking system, the research and education sector, should also be involved in the discussion. Public awareness campaigns should also be promoted with a view to making renewable energy technologies known and accepted by the public at large. Technical know-how, an important client base, and the availability of financing are key-factors to develop a strong national and international market for Egyptian companies interested in operating in the renewable energy sector. The focus should not be limited to electricity applications, but other markets, such as solar water heaters, should also be addressed. Further information on EUROSUNMED is available here. Several activities recently took place under the scope of the Competitive Solar Power Towers (CAPTure) project. The project’s 3rd General Assembly was held on 22-23 May at the premises of EDF in Paris. All the members of the consortium were present and took the chance to discuss the latest activities related to the 10 work packages. The meeting had also the presence of CAPTure External Advisory Board, which is a group composed of international CSP experts that agreed to provide feedback on the activities of the project. Furthermore, CAPTure partner IK4 TEKNIKER delivered an oral presentation at the 12th International Modelica Conference. The event was held in Prague, Czech Republic, on May 15–17, 2017, organized by The Czech Society for Cybernetics and Informatics (CSKI) and Politecnico di Milano, in cooperation with the Modelica Association. The programme covered modeling of complex physical and cyber-physical systems, as well as tools, for a wide range of research and industrial applications. The CAPTure presentation focused on the main outcomes related to regenerative bed modelling and is available here. Also, on 27th April, the project coordinator CENER presented CAPTure at "Grupo de Trabajo de Tecnologías de Concentración” from the technology platform Solar Concentra. Further information on CAPTure is available here. Ten participants from different MENA countries composed mainly by PhD students, researchers, professors, innovators and stakeholders (companies, public administrations and governments) that have a good scientific level and English language skills will be selected to participate in a traineeship in Europe, hosted by five EU partners. Due to the foreseen program of the Training Courses, the selection will be primarily directed to scientific degrees. The hosting institutions will accept participants with a different degree but with a consistent and demonstrable experience in the topics of 5TOI_4EWAS project (water, energy, food and/or nexus related fields).The choice of the participants must be consistent with the objective of the same foreseen training courses which is to motivate and strengthen the collaboration of young researchers and companies to encourage applied research and innovation in the nexus related fields. Large and Small Companies known to be involved in Nexus Research and innovation. 2 people will stay in UAB. 2 people will stay in INNOLABS. 2 people will stay in INNOVABIC. 2 people will stay in GIRAF. 2 people will stay in MUAS. Participants will receive a contribution of 1500 Euro per each - plus a benefit for the accommodation - for their secondments in Europe. EUREC Awards 2017 is now open! 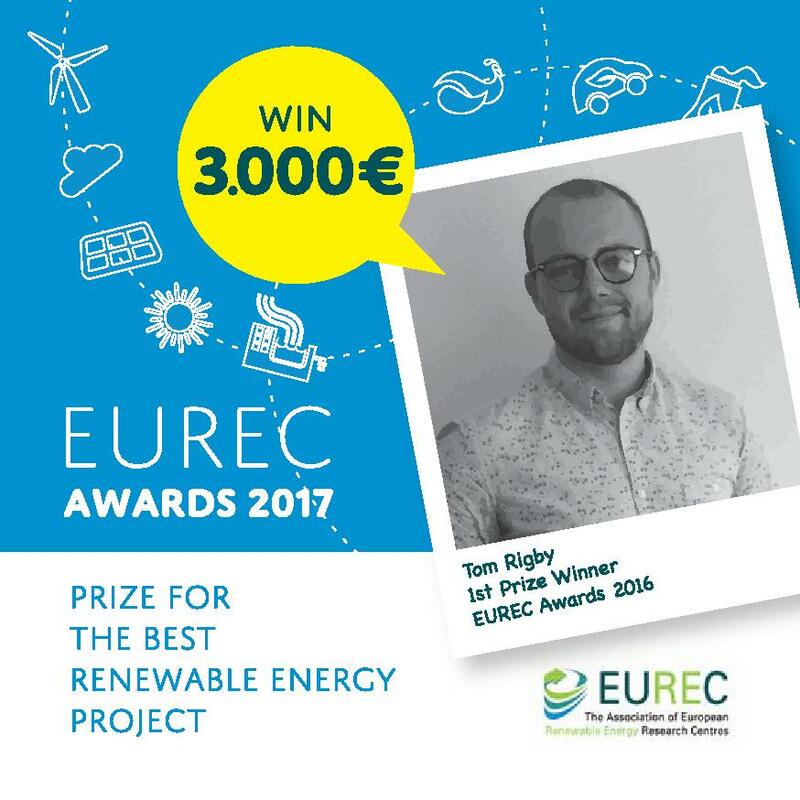 EUREC delivers three awards to the best students’ undergraduate projects on Renewable Energy. The aim of these prestigious awards is to promote excellence in the study of Renewable Energy, to reward talent and to encourage Renewable Energy debate worldwide. The awards consist in one prize of 3.000€ to the best project and two prizes of 1.500€ to the second and third selected projects. The winners of the EUREC Awards will receive them during the starting ceremony of the EUREC Master programmes in October in Brussels. The award is open to all students in the last year of their undergraduate studiesor in the year immediately following graduation. They have to submit a two-page abstract of an undergraduate project related to renewable energy, a copy of their transcripts as well as a letter of recommendation/introduction from one of their professors. The awards consist in one prize of €3.000 to the best project and two prizes of €1.500 to the second and third selected projects. If one of your students is winning a EUREC Award, we will display the name and logo of your University on the EUREC Master website, as well as in an article in our quarterly newsletter. 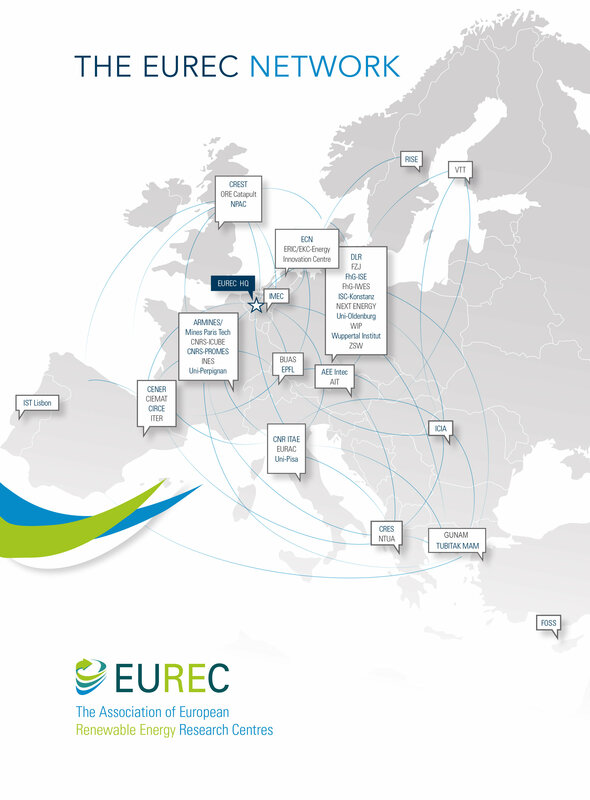 You can view here the winners of previous editions of the EUREC Awards.